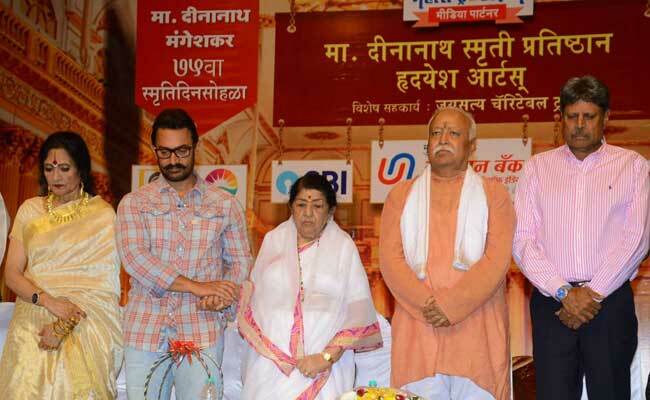 Aamir Khan received the Master Dinanath Mangeshkar award from RSS Chief Mohan Bhagwat. New Delhi: Aamir Khan attended an award ceremony for the first time in 16 years as he was honoured for his film "Dangal" on Monday. The superstar received the Master Dinanath Mangeshkar award in Mumbai from Mohan Bhagwat, the chief of the Rashtriya Swayamsevak Sangh or RSS. The 52-year-old, whose disdain for award functions is well-known, apparently couldn't refuse an invitation from legendary singer Lata Mangeshkar. The last such show that he attended was the Oscars, when his "Lagaan" was nominated in the Best Foreign Film category. The Dinanath Mangeshkar Awards, which marked the 75th death anniversary of Lata Mangeshkar's father, recognised eminent personalities in various fields. "Dangal", in which Aamir Khan played wrestling legend Mahavir Phogat and portrayed his remarkable journey of grooming champion daughters Geeta and Babita, was one of the biggest hits of 2016.
of them," Aamir Khan said after receiving the "Vishesh Puraskar". Cricket legend Kapil Dev and veteran actor Vyjayanthimala Bali were also honoured in the function. Mr Bhagwat, the chief guest, said the award winners are a source of inspiration and their good work in their respective fields would help in nation building.